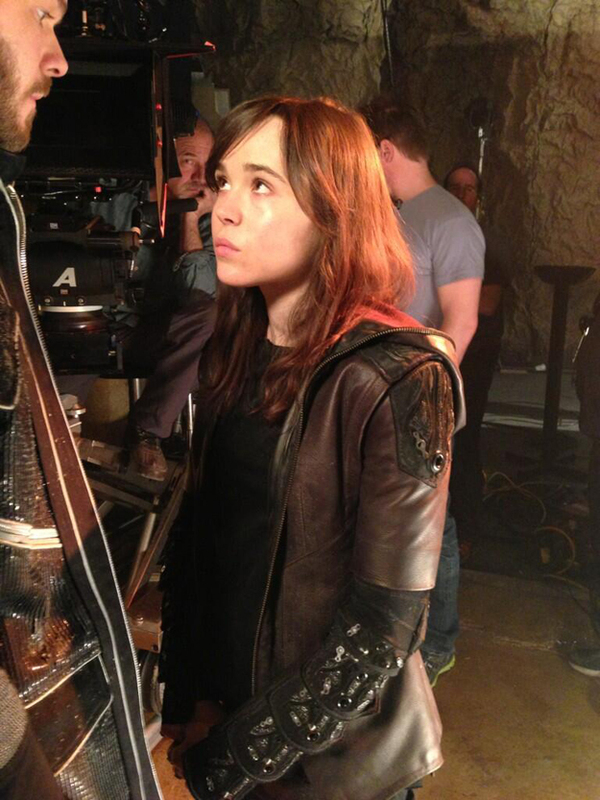 Bryan Singer has tweeted out another photo from the set of X-Men: Days of Future Past giving us our first look at Ellen Page as Kitty Pryde. It doesn't look like she's aged at all. The movie also stars Ian McKellen, Patrick Stewart, James McAvoy, Jennifer Lawrence, Michael Fassbender, Nicholas Hoult, Anna Paquin, Hugh Jackman, Shawn Ashmore, Peter Dinklage, Omar Sy, Halle Berry, Daniel Cudmore, Fan Bingbing, and Boo Boo Stewart. It's set to be released on July 18th, 2014. The film is based on the comic book storyline "Days of Future Past," which ran in Uncanny X-Men #141 and 142 back in 1981 during Chris Claremont and John Byrne's run and introduced the idea of an alternate future for Marvel's mutants that grew out of the Brotherhood of Evil Mutants killing an important senator, leading to a future where all mutants are hunted by Sentinels.